The lives and relationships of those within a British traditional touring stage company provide the backdrop for The Dresser which was nominated for five "Oscars" in 1983 (Best Picture; Best Actor; Best Supporting Actor; Best Director; Best Screenplay Adaptation). 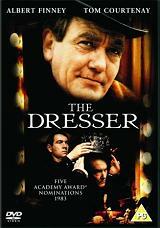 The Dresser is a compelling study of the intense relationship between the leader of the company and his dresser. Sir (Albert Finney), a grandiloquent old man of the theater, has given his soul to his career, but his tyrannical rule over the company is now beginning to crack under the strain of age and illness as he prepares for his two-hundred-seventh performance of King Lear. Sir's fastidious and fiercely dedicated dresser, Norman (Tom Courtenay), submits or Sir's frequently unreasonable demands, tends to his health and reminds him of what role he is currently playing. The two men are essential to each other's life. This is a film rich in comedy, compassion and a love of theater. Also stars Edward Fox. Also with Michael Gough.